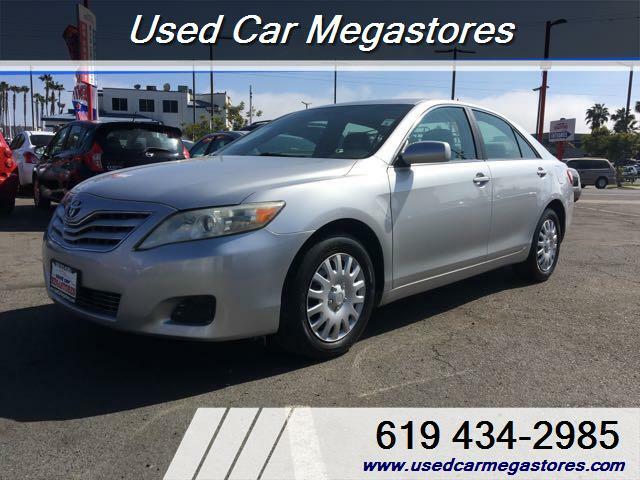 No Accidents- With a comfortable ride and roomy cabin, our endearing 2010 Toyota Camry Sedan offered in Classic Silver Metallic is a superb choice for your transportation needs. The magic begins with the powerful 2.5 Liter 4 Cylinder that is mated to responsive 6 Speed Automatic transmission. You'll score near 32mpg on the open road in this reliable Front Wheel Drive sedan! Our Camry comes with an AM/FM stereo, soft touch cloth seats, power accessories, steering wheel audio controls, and so much more! Just imagine yourself comfortable behind the wheel. This Toyota Camry remains one of the top choices in this competitive segment. With excellent crash test scores, comfort and refinement to spare, the Camry's got what most family-sedan shoppers want. Print this page and call us Now... We Know You Will Enjoy Your Test Drive Towards Ownership!